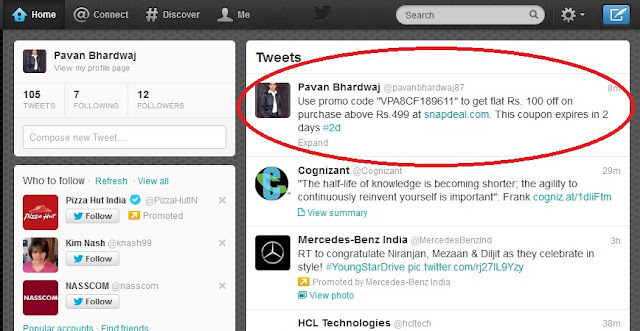 Some times we need to display our tweet for a short period suppose, if you are sharing a discount coupon code that is set to expire in an hours OR some days, your tweet could still appear in the timeline of followers who happen to login the next day though that offer would have definitely expired. Example- I have a coupon for Snapdeal website that is valid till next two from today So I am rating a tweet that will be automatically deleted when the deal coupon expires. It's a real coupon code so you can use it before 5th, Sep, 2013. Pierre Legrain, who was previously product marketing manager at Twitter, offers a very simple solution to this problem in the form of Spirit. You can set an expiration time for your tweets with the help of hash tags and the tweet will self-destruct after that time has passed. To get started, you need to log into Spirit with your Twitter account and grant read & write permissions to the app. That’s it. The app will work behind the scenes and monitor your Twitter timeline for any time-sensitive tweets. If it finds one, the tweet will be automatically deleted after the set amount of time as specified by you in the hash tag. It means You can use hash tags like #12m (for 12 minutes), #2h (for 2 hours) or #5d for tweets that are to be auto-deleted after 5 days. You can post tweets from the web, from your phone or even through an email message and Spirit will find it as long as you have added the hash tag in the correct (#\d+[mhd]) format. Note : If you ever wish to pause or disable Spirit from deleting your tweets, just go to your Twitter account settings page and revoke access to the app.